Writing has been the cornerstone of my morning practice since its beginning. I’ve written about personal and business issues, ongoing struggles, questions I have about my any aspect of my life, and a host of other topics. No subject has been off limits. As I write I affirm that what I do, feel, think, and say has value. My writing has become a vehicle for me to listen to myself, to pay attention to what’s going on in my life. I record thoughts, feelings, and emotions that come up during the day. Writing is also an opportunity to note significant developments in my life, as I define them. It could be how I handled a business or personal situation I’d found difficult in the past. Writing allows me to process what I’ve experienced, reinforce the lessons I’ve learned, make connections and see continuity. Moreover, I create and document a personal history to review and learn from in the future. To these ends, I’ll often consider the events of the previous day when I sit down to write. What happened? What people did I meet? How did I feel about these engagements? What did I learn? How does this experience reveal my progress, or areas where I need to improve? I’ll also often look ahead to the events of the coming day, or even beyond that if there’s something weighing on my mind that’s creating anxiety. How will I handle what I’m likely to encounter? What are my goals for a particular event or activity? I also note related feelings and thoughts that arise. If I’m feeling anxious, I focus on that feeling in my writing to see if I can get at the root causes. For example, I’ve often found myself unable to focus on writing because I’m preoccupied by thoughts of what I have to do that day. So I’ll write about the particular task and associated fears. More often than not, writing with this intent will help dissipate my anxiety and enable me to move on with my day. 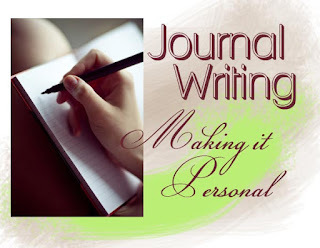 In other words, I’ll write about a topic – any topic – instead of ruminating about it. I also use writing as a way to debrief after attending events, meeting with someone, and/or other significant life events to capture my thoughts and feelings and to pinpoint insights gained and areas where I need to focus my energies for continued improvement. As I’ve implied above, there are no rules when you write in the manner I’ve discussed. The most important thing is to write – that’s it. Your penmanship might be sloppy, your grammar incorrect, your spelling atrocious. It doesn’t make any difference. No one will see your work but you, unless you choose to share it. Quality is irrelevant. The commitment is most key. The more you write the easier it is to write, and as a result it’s more enjoyable as well. An added bonus I’ve discovered is that the more you write, the more likely you are to access content you might be able to use elsewhere in your life. And that is what I’ve identified above is the ultimate goal of a morning practice – cultivating the ability to live a richer life.